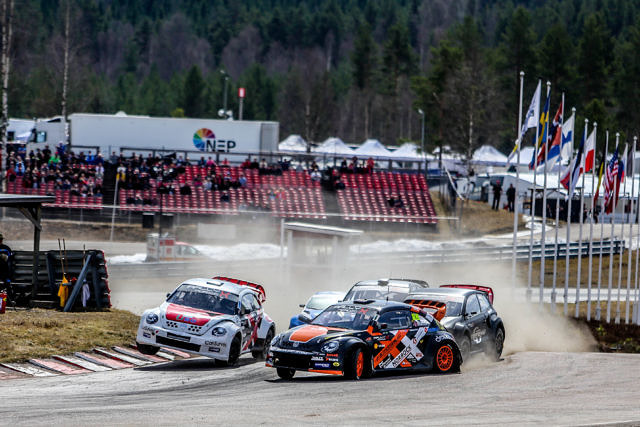 RallyX Nordic is a Rallycross Championship and includes the classes Supercar and Supercar lite. The Supercar class is rallycross ‘s real heavy weight class. The cars are manufactured on the basis of ordinary passenger cars but with engines of 600 horsepower and four-wheel drive, the cars have an acceleration that is in class with an F1 car. A supercar car can easily be described as a combination of a tank and a dragster – it is built to withstand ironing, work on all types of surfaces and is still faster than anything else that can run on four wheels. The driver has to help control the power with his right foot – there is no active electronics to make it easier for the driver. The regulations for supercar are the same in Rallycross in the European Championships and the World championships. Several of the cars running in RallyX also participate in World RX and the European Championships. Supercar Lite’s offers performance that is close to the supercar and the purpose of the class is also to serve as a gateway for drivers who want to make their way to rally cross’s top Formula. The car is designed by Olsbergs MSE to emulate the characteristics of the supercar cars as far as possible. Four-wheel drive, 2.4-liter engine of about 320 horsepower and a six-speed sequential box, all mounted in a tube frame chassis manufactured by the CDS give drivers a real challenge. The class also runs internationally together with the World Championship in RX2 and the American Global Rallycross series. All participants have the opportunity to run two free trainings for a maximum of 4 laps each. The heats are run over four laps. Each participant runs three qualifying rounds with a maximum of five cars in each heat. After each first qualifying round, the position of the drivers in the qualifying round is calculated based on the total time in each heat. After three qualifying rounds, the twelve to eighteen drivers with the highest total qualifier points go to the either 2 or 3 semifinals depending on the number of entries. Drivers who do not participate in the first qualifying round receive no points. Championship points after qualifying rounds are awarded as follows: 16,15,14,13,12,11, etc. The semifinals run over 5 laps with the 12 to 18 drivers taking the most points from qualifying rounds 1-3. The semifinals and starting positions assigned to the drivers are based on the count of the qualifying points from qualifying rounds 1-3. Selecting the starting track in the ranks is the highest qualifier score from qualifying rounds 1-3 select first. Start grid of 3 LEDs (2-2-2). Start grid of 3 rows (2-2-2). The first across the finish line in the final having taken the Joker is the winner of the competition. The alternative track/Joker lap is to be used once per heat in the qualifier, semi and final.